Alcohol is the traditional fuel of journalism, so perhaps it was particularly appealing that Intel showed off a computing device powered by wine at the final day of the Intel Developer Forum. As “mobility” is now the watchword at Intel, it made sense that Genevieve Bell, director of interaction and experience research at Intel, provide Intel’s vision of the future. Well, seven billion futures, Bell suggested, one for each person in the planet—each governed by a user’s unique, contextually-driven interactions with mobile devices. Bell, an anthropologist by profession, often appears at IDF to provide a softer, more human contrast to the detailed descriptions of transistors and logic that characterize Intel’s developer conferences. Bell and her team conducted 250,000 interviews in the last year across 45 countries to construct a worldwide mosaic of how users interact with their mobile devices. In fact, one of the themes of Bell’s talk was that although mobile devices are growing rapidly—6.3 billion mobile subscriptions are spread over 4 billion people, with 1.9 million cell towers moving 5 exabytes of data—the industry was wrong to focus on the devices themselves. New ”Quark” line of embedded processors. Mobility is about how we spend our days. The mobile phone can be used to move money. What we say we’re doing with mobile is different than what we are doing: such as texting in the car, for example. Finally, how we engage with mobile devices is different than how we engage with the real world. Would you like some chips with that wine? 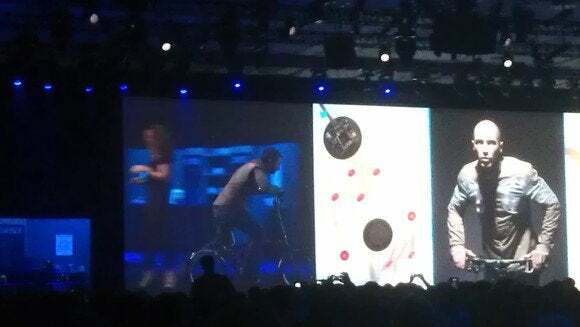 None of the demonstrations that Bell and others displayed on stage will necessarily come to pass; however, the mad scientists within Intel’s labs whipped up a few demonstrations to whet users ‘appetites. Probably the most intriguing was an experimental microprocessor that was powered by microwatts, a thousand times less power than the watts that power a traditional PC. Mike Bell, a former Apple executive who also oversaw Palm’s product development (and no relation to Genevieve) watched as an acidic Chilean red wine was poured in a glass with two electrodes attached. The processor then sensed, communicated, and controlled a 3D flower on a display. “We have technology in the labs… that runs forever,” Mike Bell said. Genevieve Bell also demonstrated a protype jacket, with LEDs woven into the fabric. The LEDs were connected to accelerometers designed by Fraunhofer, with flexible circuitry. When a bicycle rider wearing the jacket hit his brakes, the LEDs lighted up, alerting other cyclists and drivers that he was was coming to a stop. The LED jacket, as introduced by Bell. Another research project at Intel showed off a dual-screen laptop prototype, where one screen was private, and the other, on the back of the display, was a “public” screen broadcasting tweets and other messages. Finally, Lama Nachman, another senior Intel researcher, showed off a demo that showed off how recommendations might change depending on how mobile users interact with another. A user who likes Chinese food, for example, can discover another user is nearby either by listening for another user or by proximity technology.